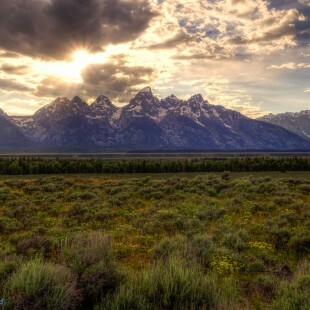 After our scenic drive up to the Jackson Hole area and our day out kayaking on String Lake, we had one day left in the area before heading home. 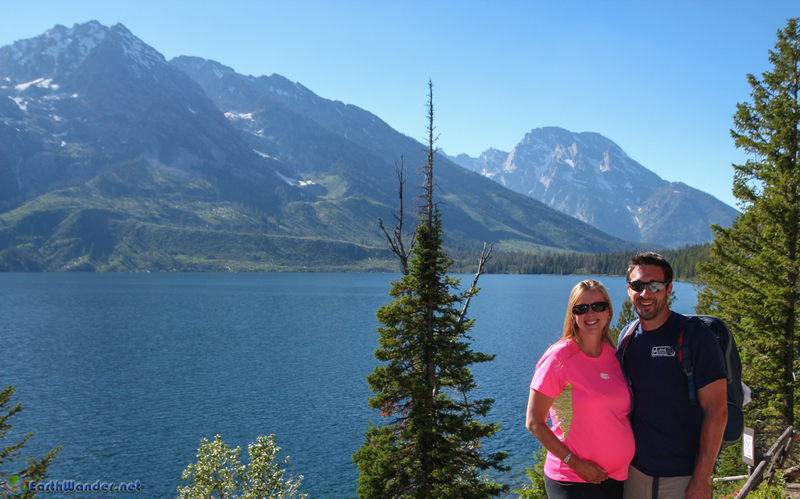 Since Stacie was now cranking along at 34 weeks pregnant, we decided against any major hikes. Don’t want those uterus ligaments stretching out. When we head back to the area we’ll probably do the hike up to Inspiration Point and beyond into Cascade Canyon, but for this trip we decided to spend our last day doing the scenic driving tour of Grand Teton National Park. However, since we’d been staying in the park for a couple of days already we’d already seen a lot of it in passing, and it’s really not even a full day trip without the hiking/walking. So, with our location being so far north in the park, I was determined to get up into the south end of Yellowstone for part of the day even though everyone on Tripadvisor was against it. We decided to do Yellowstone in the morning, since you really don’t want to be driving around Yellowstone at night with the all the wildlife. 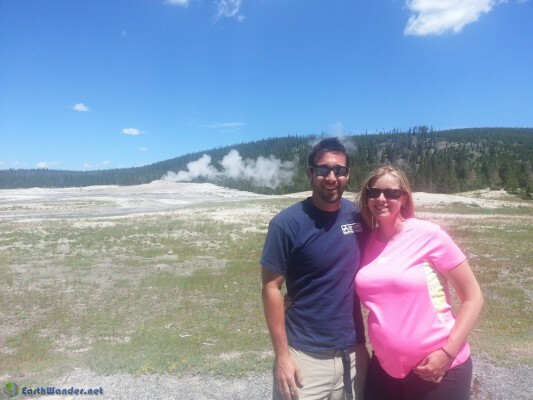 We got going at a reasonable 9am or so with plans to see some thermal pools and geysers via West Thumb Geyser Basin and Old Faithful before heading back to Grand Teton. 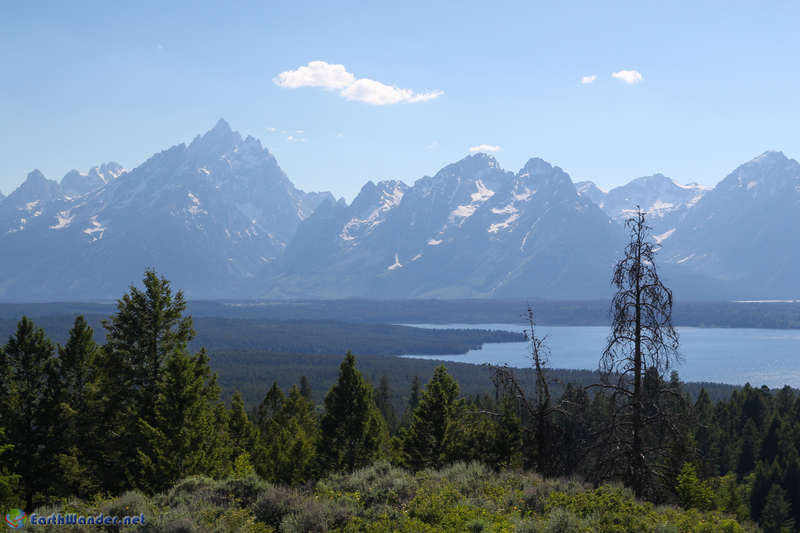 The drive was nice and took us past Jackson Lake Overlook to the north, which we otherwise probably would have missed. 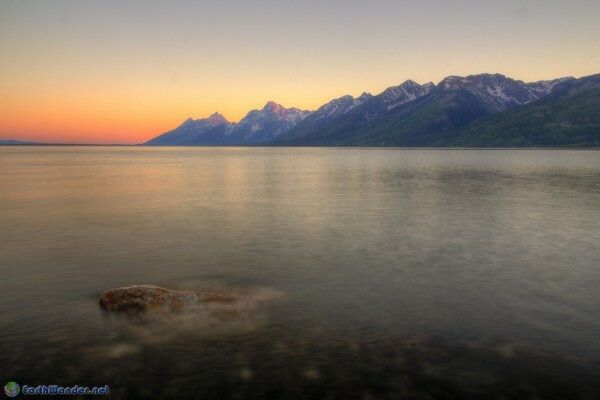 It’s a good thing we didn’t miss it because I decided that would be my sunset photo spot for the night, as it looked like the sun would light up the north sides of the mountains and the lake/rocks and wildflowers in the area would make for a nice foreground. Continuing towards Yellowstone we came across Lewis Falls, which was a nice surprise as the falls were right by the road. Most people were enjoying the waterfall view but the view on the other side of the road was perhaps even more scenic, with a mountain creek winding through a grassy meadow with a snow capped mountain from the Teton Range in the background. Beautiful. We finally made it to West Thumb Geyser Basin, probably about 80-90 minutes from when we left Jackson Lake Lodge. The traffic was not bad at all despite the holiday weekend. The area was pretty similar to how I’d pictured Yellowstone, with boardwalks going out around thermal pools and bubbling cauldrons. 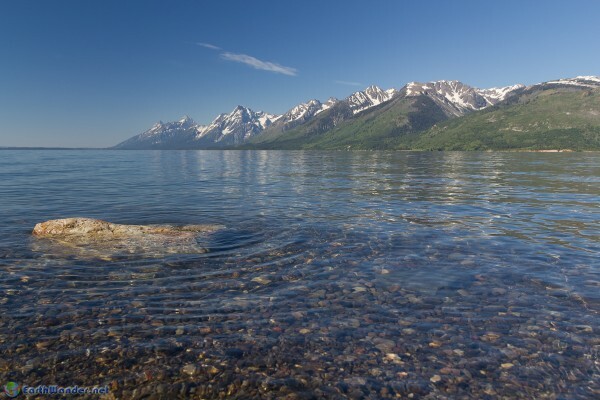 Having Yellowstone Lake as a background to the area was a nice bonus as well. 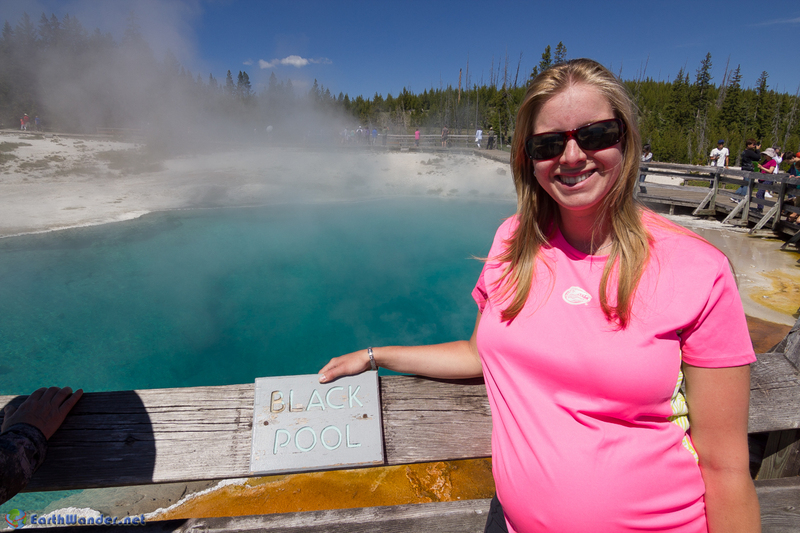 The brightly colored pools and runoff to the deep blue lake behind provided a very cool contrast. Some kayakers paddled by in the lake near the shoreline and several visitors asked if the water was warm due to the thermal pools draining off into the lake, to which they responded that it was cold. The next stop was Old Faithful. It would have been a shame to get so close to it without visiting so we couldn’t pass it up. It was 17 miles down the road from West Thumb Geyser Basin though the drive seemed to take a while. As we pulled up we were pretty blown away by how large the area was. The parking lot looked like it was for an NFL stadium, and there were multiple buildings and stores around. Old Faithful erupts every 60-110 minutes, depending on how powerful the previous eruption was. As we pulled up we didn’t notice a lot of people leaving, which we took as a good sign as we figured it meant that we hadn’t just missed an eruption. It turns out that we were correct, as the next eruption was set to go off in about 25 minutes, plus or minus 10 minutes on either side. Stacie was feeling a little light headed, so we went ahead and had our peanut butter sandwiches at a spot in the shade before taking up a front row seat at one of the many benches that line the area directly around Old Faithful. While we were waiting for Old Faithful, another of the many geysers in the area started erupting about a half mile away. Soon after, Old Faithful started spewing out a few short bursts of water, which it does in the minutes leading up to its eruption. Finally, it erupted fully. I grabbed a few photos of it and then started setting the camera up on the tripod to capture a timelapse, but the height of the water coming out of Old Faithful quickly dropped to less than half what it erupted at. While the eruption typically lasts 3-5 minutes, the full height of the water that you typically see in photos lasts less than 30 seconds before it recedes drastically. We looked to our left at the geyser that had started erupting while we were waiting and it was still going at full power. I guess it’s true that Old Faithful’s claim to fame is its reliability and not its visual flare, though it was still very cool to watch. As the fountain puttered out, we went in to the Old Faithful Lodge and General Store for some souvenirs. Stacie came out with a large ice cream cone instead and I picked up a Yellowstone pint glass to add to my pint glass collection. That concluded our brief side trip to South Yellowstone and we began the drive back to Grand Teton. The drive back took us a little under an hour and a half, getting us into Grand Teton at around 3-4pm which left us plenty of time to see more of the park. We stopped by the visitors center where I also added a Grand Teton pint glass to my collection, and we both picked up a couple of Grand Teton stickers for our kayaks. Stacie had the idea of decorating the kayaks with stickers of places we’ve used them. We’ll see how those hold up in the water. 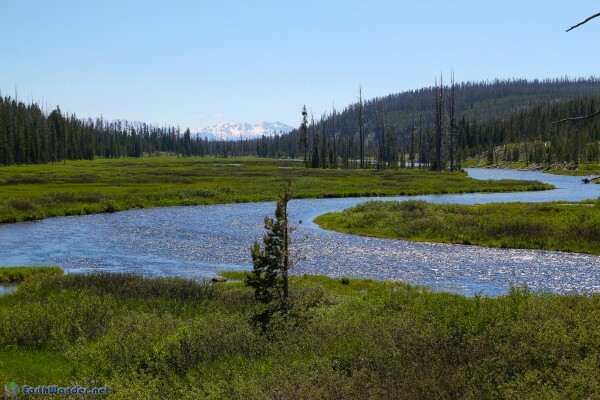 We’d already seen Schwabacher Landing, the Jackson Lake Dam, Snake River Overlook, and String Lake so our scenic drive around the park was a bit shorter than the one you typically here about, though we ended up driving right back past all of these places anyway. We were also getting tired already so we probably didn’t do the drive justice. Our main stops along the way this time were Signal Mountain (not the one in Chattanooga! ), Jenny Lake Overlook, and Mormon Row. Signal Mountain is more of a hill, an 800 foot climb (drive) to an overlook that should have provided great views over the Tetons and its surrounding lakes, but really didn’t. The problem is that the overlooks are on the wrong side of the mountain. The first overlook is the better one, as with a short walk you can at least get to the side of the mountain to get a view of some of the valley, but a big panoramic of the Teton range this is not. The overlook all the way at the top is worse, as it faces completely east and you can’t see the Tetons at all. 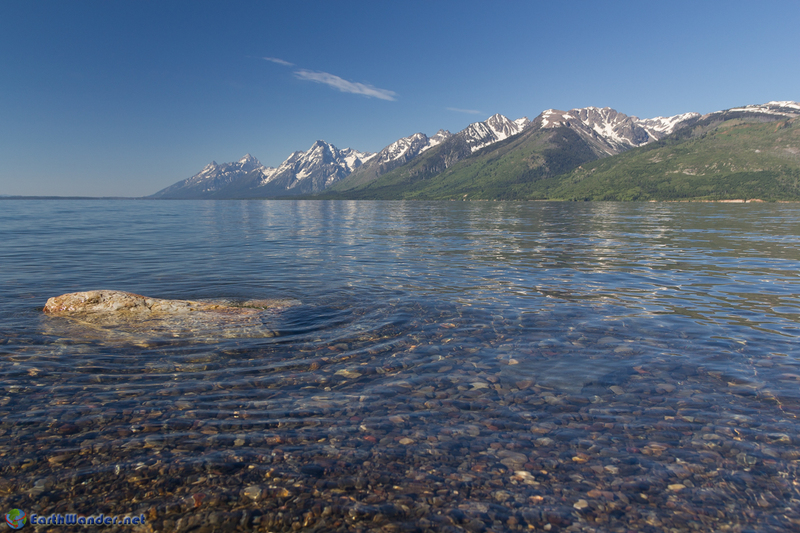 Jenny Lake was very pretty, though all the beautiful mountain lakes were starting to run together for us by now. You have several options at the lake. There is a nice flat trail that winds around the lake. We were planning to do this as it was more of a walk than a “hike” (which would be too strenuous on Stacie at this point in her pregnancy), but we just didn’t have the energy when we arrived. 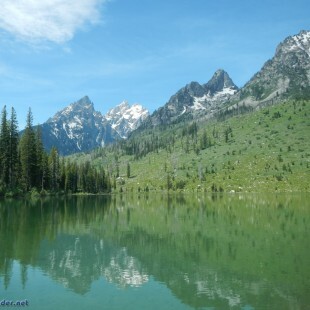 The main attraction of the lake is the hike up to Inspiration Point and Cascade Canyon on the other side. You can access the trailhead either via a walk around the lake or a boat ride across it. Most people choose the boat ride. This is definitely a hike that we’ll be doing the next time we make it back to the park. As a last stop before grabbing dinner we stopped at the Chapel of Transfiguration, a church with the alter and its background window built to frame up the Tetons perfectly. I’m not the church going kind of guy but if I was ever going to go to one, this would be it. Now hungry in addition to being tired, we snapped a few photos from the overlook and moved on to find some food. We ended up at Dornan’s just outside the park boundary which has an outdoor BBQ called the Chuckwagon that was too smokey for Stacie, and a pub-style pasta/pizza place with a great view over the Tetons. We ate at the latter (My Tripadvisor Review), and other than the extremely annoying ordering process there, enjoyed our meal. The sun was getting late in the sky and we were still a long ways from my chosen sunset spot for the night (Jackson Lake Overlook), so we headed that way. It ended up taking even longer than expected to get there, almost an hour, and when we arrived I rushed out of the car to start snapping pictures. 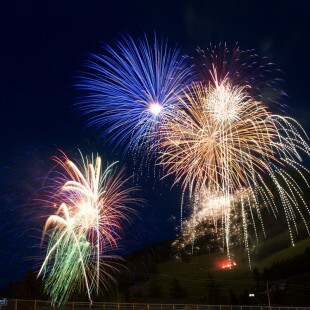 It was a bit of a debacle, which I thoroughly covered in a recent post over on my photo site, but at least we made it in time. Jackson Lake Overlook by dusk, a few bumps and bruises later. The next morning on our way out of town we turned down Antelope Flats Road, which had some beautiful wildflowers blooming, and onto Mormon Row and the two most photographed barns in the world. 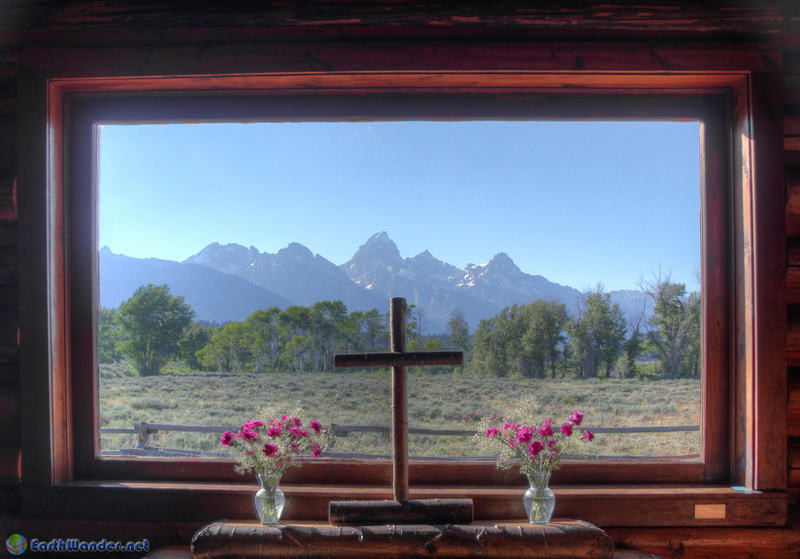 There was a wedding going on at one of the barns with a beautiful Teton backdrop. That concluded our trip and we took the same scenic route back to Ogden that we’d taken to get here. 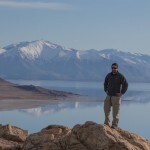 Owner and operator of Earthwander.net, I'm a guy in my early 30's who loves photography and traveling with friends and family.